A black and white photograph of the Whitby Baptist Church. This church was built by the Presbyterian Church in Canada on the north-west corner of Colborne an Centre Streets in 1869. 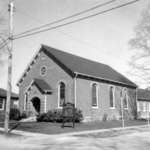 In 1875, the Presbyterian Church in Canada united with the Church of Scotland and worshiped at St. Andrew's Presbyterian Baptist Church. In the late 1960s it was a Mediterranean Spaghetti House and was demolished in 1977 after being vacant for several years. Whitby Baptist Church, May 1967, Brian Winter. Whitby Archives 09-006-014.